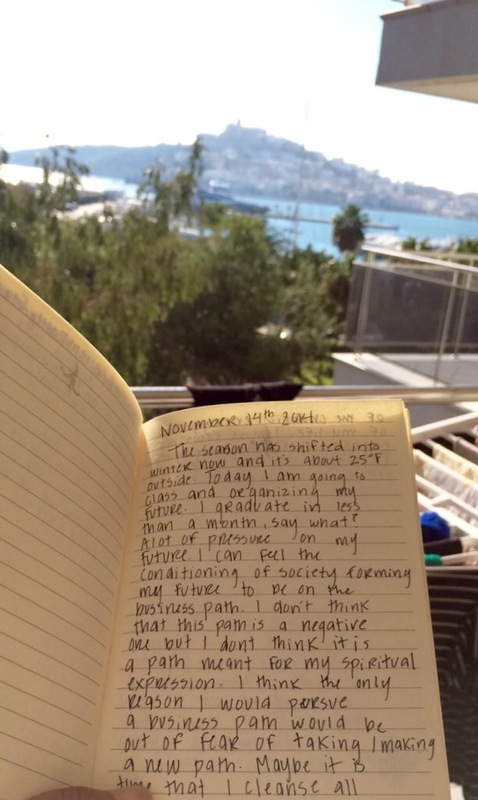 What I wrote a year ago vs. Where I am today | Ibiza, Balearic Islands. I was cuddled up in a cold bed in Lubbock, Tx, as noted in the journal entry below. I was a soon to be graduate with fear of the unknown. However, the interesting thing is I already kinda knew. I knew what I wanted. I wanted to travel, meet people, learn new things. And I knew the current environment I was living in wasn’t going to cut it. I wanted a whole new shift in my reality and I was craving it to the point that I started creating it. Today I am writing this from my Balcony in Ibiza, Spain. The weather now is 68 F or 20 C. I had breakfast on the beach and then came home to hang up my laundry. After hanging up my laundry, I pulled out one of my old journals and began to reflect on past selves. Happy to say I’m making an old me proud. Next Post Two Parts of my Heart. | Ibiza, Balearic Islands.